In April 1917, a Canadian soldier standing on a war-ravaged battlefield in France pocketed a souvenir to send home: a handful of acorns from a downed oak tree at Vimy Ridge. Now, a century after the First World War ended, oaks descended from those acorns have begun growing at parks and cenotaphs across Canada. And the Vimy oaks have made the journey back to France, where they will grow in a new centennial park beside the Canadian National Vimy Memorial. The project is possible thanks to the late Lt. Leslie Miller, who gathered the acorns from the denuded site of the 1917 battle and planted them on his farm in Scarborough, Ont. They thrived in their new habitat, where 10 are still standing on land that now belongs to the Scarborough Chinese Baptist Church. Ralph Coleman, a vice-president of the non-profit group Vimy Oaks Legacy, said the trees are a powerful symbol of the connections between Canada and France and of soldiers' resilience. "There's such symmetry to it," he said of the oaks returning to France. "Out of death comes life and regeneration, and it comes full circle. "There were no oak trees left on Vimy Ridge, and now the oak trees that grew up in Canada descended from Vimy Ridge are sending their own descendants back." The park in France, set to be to inaugurated Friday in advance of the centennial of the war's end, will feature four concentric rings representing the four Canadian divisions that fought at Vimy. Shady pathways will offer a direct view of the neighbouring monument. The 1.6-hectare park was created by the Vimy Foundation, a charity that educates Canadians about the milestone battle. Coleman said the idea of sending back the trees began in the mid-2000s, when the founder of Vimy Oaks Legacy, Monty McDonald, travelled to the famous battlefield and realized that none of the original oak trees at Vimy had survived the intense shelling. McDonald had worked on Miller's farm, and the Vimy veteran was like a grandfather to him. As Coleman tells it, McDonald thought: "Wow, wouldn't it be a nice gesture to repatriate some oak trees back here from Canada and a nice gesture to my surrogate grandfather, Leslie Miller." In 2015, cuttings were taken from the original trees in Scarborough and grafted onto roots at a nursery in Dundas, Ont., where they began to grow as new trees that could be flown to Vimy. The group had hoped to have the project ready for the 2017 centennial of the battle, but that fell through when an outbreak of a disease affecting oak trees led the French government to ban tree imports. Instead, McDonald gathered acorns from the original trees and flew them to France in 2016, where they have been growing in a nursery and will be transplanted to the park in time for the inauguration. Meanwhile, the saplings grown in Dundas are making their way across Canada, where over 800 have been ordered for planting at legions, parks, war monuments and private residences. 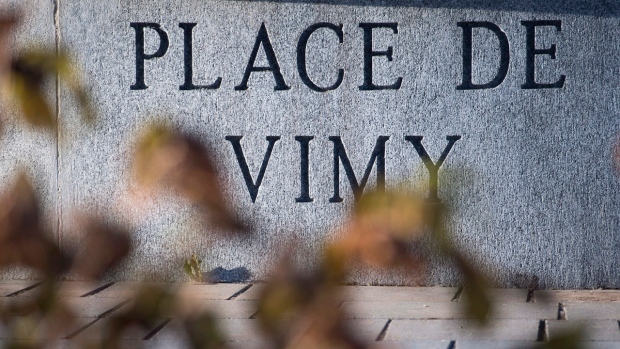 Three are destined for a park in Montreal's NDG neighbourhood dedicated to Vimy, where they'll line the pathway leading up to a large stone cenotaph. City councillor Sterling Downey said the idea of using Vimy oaks came after a microburst swept through NDG park last year, destroying many of its mature trees. Downey, the son of a veteran, said the trees symbolize the ability of both humans and nature to overcome great adversity. 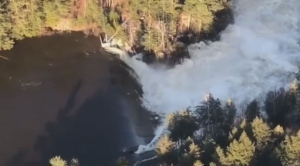 "These trees are a nice living memorial to celebrate life after this atrocity, and as a reminder hopefully that this will never happen again," he said. The gesture is appreciated by Della Robertson, a Sergeant at Arms of a local Royal Canadian Legion branch whose grandfather served at Vimy. Robertson, 54, was at the Montreal park in uniform Sunday as local politicians and citizens held a small remembrance ceremony organized by the legion. She said she likes the idea of having something to connect the past to the present at a time when fewer young people seem to feel personal links to Canada's military history. "You need to work to keep that connection," she said. "There are some schools that do ceremonies, but very little. There's very little connecting (them) to 100 years ago."